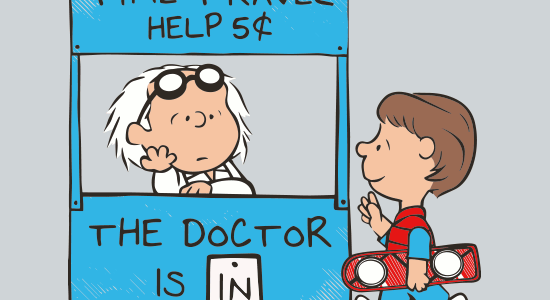 The Futurenuts tee design is for the Peanuts and Futurama fans. And yes, this is what Charlie brown would look like if he had hair. Now you know. The concept for the Futurenuts tee is to mash up The Peanuts with Futurama. 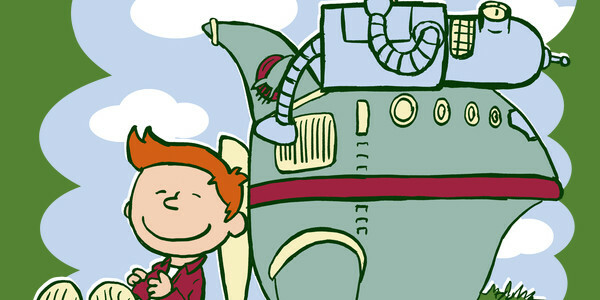 Legendary Phoenix drew Philip J. Fry, Bender and The Planet Express Ship "Bessie" in the Peanuts style which is smart. Because if he were to draw Bender as a beagle or some stupid Doctor Who K-9 rip that would had sucked. He brings only the best elements of both franchises together and does so beautifully. 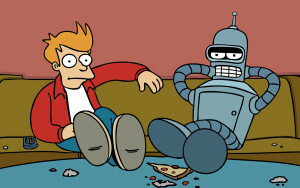 The laziness of Fry and Bender couldn't be represented any better. Well maybe if there were a TV in the design. 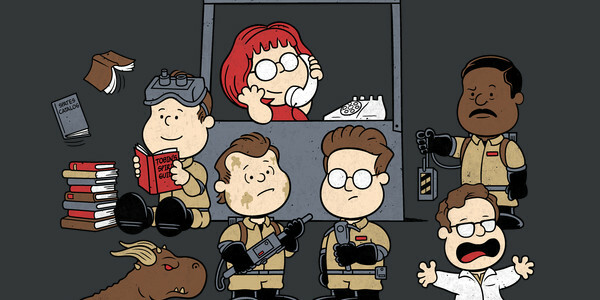 As for the artwork, the Peanuts style works oddly enough considering the futuristic aspect of Futurama. 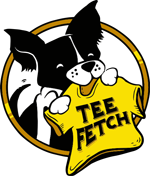 The colors are appropriate for both franchises and the classic Charlie Brown with Snoopy on top of his doghouse layout makes for a great shirt. The simplicity is what makes it great. The background seems a bit odd but it works in its irregular panel form. Green tees work best for this design due to the grass. This Futurenuts tee is more for the laid back cartoon lover of all types. Bringing a little old to the fairly new. Futurenuts Tee Design Legendary Phoenix. I’m Not Nuts Tee Design Review. The I'm Not Nuts tee design is a great mash up of the Peanuts comic strip and< em>The Big Bang Theory. Damn physicists aren't paid much based on this shirt. Sheldon taking the place of Lucy and Leonard replacing Charlie works well and the Charles M. Schulz drawing style is respectfully done. The condescending expression that Sheldon is giving Leonard is true to the show as well as lends his snarky personality to the tee. This tee is great to wear anywhere casual such as comic cons or to the mall. Any fan of The Big Bang Theory should love this tee. I'm not Nuts Tee Design By Warbucks360. Happiness Is A Warm Blanket Tee Review. The Happiness Is A Warm Blanket tee is for fans of the beloved Peanuts comic strip that graced the funny pages from 1950 to 2000 and since as reruns. 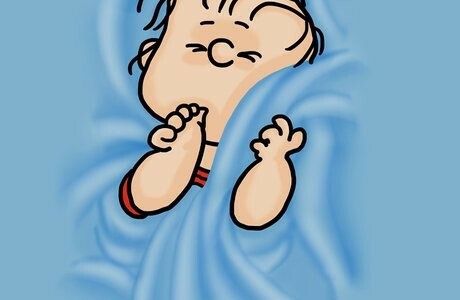 The use of the shirt fabric as that of Linus's Blanket is a clever concept. It adds a neat illusion of depth to the otherwise two-dimensional comic. The iconic character himself is easily recognizable, so everyone will get and understand this tee concept. The fact that the blanket illusion is wrinkled and wadded in appearance means this is a tee that does not need to be folded or ironed as the wrinkles would fit in with the design. The Happiness Is A Warm Blanket design makes for a cute shirt to wear to any casual occasion. It is available in Men's, Women's, and Kids' tees which is great as no one gets left out due to age. If you or someone that you know is looking for a lighthearted carefree tshirt with a piece of Americana, this may be it. Happiness Is A Warm Blanket Tee Design by Rodrigo Leonardo Batista Ferreira.